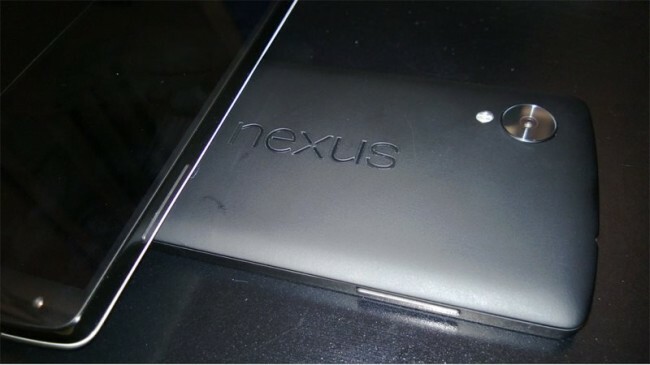 An alleged new image of the Google(s goog) Nexus 5 handset appeared online in an unlikely place: the MacRumors forums. The image, posted on Monday, was spotted by Droid-Life which also reports expected specifications for the as-yet unannounced smartphone. The picture looks legitimate based on the Nexus logo readable in landscape mode; the camera sensor and flash placement also jive with a Google video that accidentally (or on purpose) leaked the smartphone. The forum poster says he held the phone, which is smaller in size than the LG G2 with a back that feels like the new Nexus 7 tablet. A data so far indicates that LG is building the handset for Google; if so, our review of the new LG G2 could give you a good glimpse into what to expect from the Nexus 5. Please don’t raise the price. Also, any word on which Sprint MVNO will carry the Nexus 5?